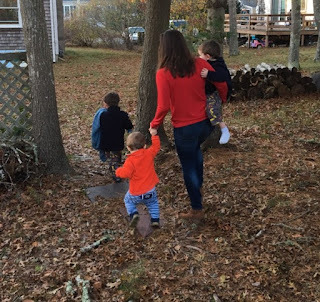 After we get home from the Cape, I like to take a few minutes and look at all the photos and videos from the few days we spend down there for Thanksgiving. It's usually a whirlwind - lots of packing, traveling, unpacking, handling life with three toddlers, all the while trying to catch up with family and have a few minutes to ourselves. Nonetheless, we have a good time. Here are a few highlights - and check out my instagram video "shazbythesea"....I love making those compilation videos! And in case you are interested, here is a recap from our 2016 Thanksgiving. For those who don't know, Jim's side of the family usually goes down to the Cape for Thanksgiving. They've been doing it for about 20 years. I personally love it. I started going in 2008 when Jim and I got engaged - and I think it's an awesome tradition fun for Conor, Caden, and Cal to experience. We typically arrive in our house and get settled. I try and make most of the sides/appetizers at home and then bring them down. After about 10 minutes the boys ask to go to Nana's house to play. We trek through the backyard (haha its like 50 yards) and the kids are SO excited. They can't get there fast enough. Here we are walking over! The boys were able to spend some time with Uncle Joe and Auntie T! On Friday morning, we paid Gramps a visit on his boat. He rides the ferry to Nantucket. We went to visit him around 8am and Conor and Caden toured the boat. They thought it was SO cool. Cal hung out with Mommy and Daddy while we waited for Caden and Conor to be done with their tour. Even if just for a few minutes, we always try and make a stop at the beach. The boys associate Cape Cod with the beach - so whenever we have a few minutes, we pop over. They freak out and start screeching as we pull into the parking lot. Most of the time they ask us to get out - but not always. Today they did and we had so much fun. As I mentioned, my parents joined us this year for Thanksgiving. They stayed at a hotel in downtown Hyannis. They made sure to stay somewhere that had a pool. The boys haven't swam in a pool since their swim lessons last year - or "Kiki's pool" a few times over the summer. They kept calling it Papa's pool because it was at my Dad's hotel. When they saw it, they couldn't contain themselves. Jim and I made a stop downtown with the boys to do a little shopping. We grabbed some coffee and walked around. We also bought them a new pair of Crocs! Totallyyyy needed. We may give them to them for Christmas, or we may just bust them out tomorrow. Their current pairs are completely falling apart. I don't know why - but this was the FIRST time they went out to try on a new pair of shoes. I usually just amazon prime them! They had fun trying them on and looking in the mirror. Thankfully it was pretty quiet down the Cape, so we were able to take over the store. We had a little photo shoot on the beach today just prior to leaving. It was an absolutely gorgeous day!! I hope everyone had a wonderful Thanksgiving!! Now it's time to take out the Christmas decorations...yay!